There are 3 main styles of caster stems; these are Grip Ring, Grip Neck, and Threaded. Choose from the images below to select the stem type that matches your caster's stem style and either click the image or scroll down to the corresponding section. 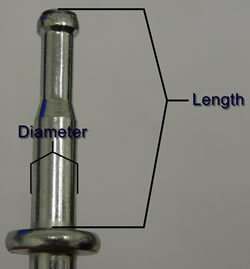 Grip ring stems are one of the most common connection types for office chairs. For the most accurate results a micrometer or caliper should be used to measure the diameter of the stem, but below we will demonstrate some ways to get the measurements using common household items. We recommend using at least 2 of the methods described below to ensure accuracy. To measure a Grip Ring stem with a wrench, simply gather both a 7/16" and 3/8" wrench. 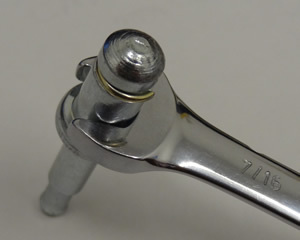 Place the open end of the wrench around the stem, as shown below. Whichever wrench fits almost perfectly will be the size of your stem. Note: A tiny bit of wiggle room or "play" is to be expected when using the wrench method. The 3/8" wrench will never fit on a 7/16" stem, and a 7/16" wrench will be very loose on a 3/8" stem. For this method of measurement, simply take a small strip of paper and wrap it around the stem. Mark the paper with a pen or pencil where it overlaps, careful to keep the wrap tight. Then measure the strip from the start of the wrap to the mark. If the ruler measures 1-3/16", you have a 3/8" diameter stem. If the ruler measures 1-3/8", you have 7/16" diameter stem. Click here for a printout of various stem types. Compare your stem to the printout to find out your stem's size. Please note the printout must be printed at 100% size in order to be accurate. Grip neck stems are most commonly used in wooden or metal tube furniture in conjunction with a socket. In most cases, if you measure the length of the stem and it is 1.5" long, you have a 5/16" diameter stem. If you are confident that is not what your stem measures, please measure it (or have it measured) precisely with a caliper or micrometer for length and diameter so we can find a match. 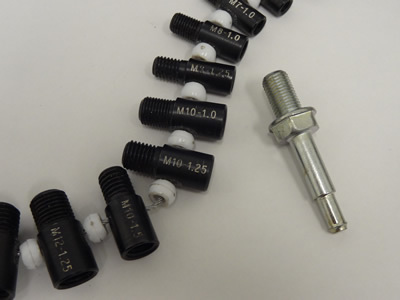 Threaded stems require very specific measuring tools in order to find the correct diameter and thread pitch. Because of the many sizes and variations (metric, standard) the only way to be 100% confident of the measurement is to use a thread gauge. 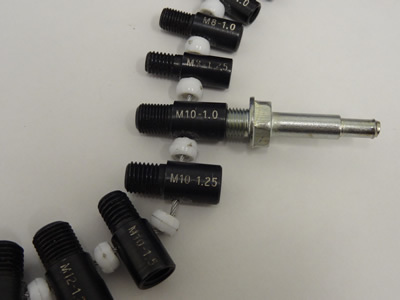 Pictured below is a thread gauge and threaded stem. If you don't have your own thread gauge, most hardware stores will be able to help you. Would you like help measuring or replacing your casters? Send us one of your casters (stem included) and we'll make sure you get the proper replacement. 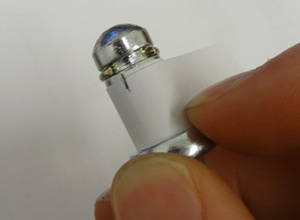 Click here to send us caster samples. Also See: how to measure caster wheels.